During this summer’s Canada Day long weekend, Ryan Sharp needed pictures of some beer coolers in Quebec convenience stores – so he turned to an army of iPhone-wielding shoppers to deliver the goods. By the end of the long weekend, the partner of Richmond Hill, Ont.-based Sales Promotion Services Inc. returned to find all the data he needed. The job he’d submitted to Field Agent Canada for its user base of mobile freelancers was to collect images from 40 different stores. The results helped him craft an in-store marketing display for a big beer client. Field Agent Canada offers crowd-sourced retail intelligence and marketing survey responses at a low cost. 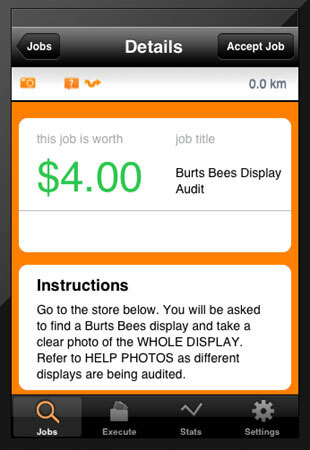 Its agents simply install an iPhone app that lists the jobs available in their areas. Tasks might range from answering a 10-question survey to earn $2 to spending half an hour in a store to collect price information on specific products and snap pictures of how they’re displayed for $50. Businesses that need the data simply phone it in to the Field Agent call centre or fill out a self-service Web form. Originally founded in Bentonville, Arkansas, Field Agent has been available in Canada for just more than one year now. The parent company was spawned about two and a half years ago in the shadow of Wal-Mart’s headquarters, just one of the many vendors created in that town that cater to the retail giant’s needs in running a massive vertical supply chain. There are now 13,000 iPhone-toting field agents in Canada, and more joining every day, according to Jeff Doucette, general manager of Field Agent Canada. A typical task in the Field Agent app. Clients that use the service are a mix of retailers that are investigating their competitor’s strategy, suppliers that want to see how their products are being displayed and priced, and the food services industry. A “secret shopper” type job might involve asking an agent to order a hamburger at a restaurant and then reporting back on the service experience, complete with a photo of the sandwich as it’s presented. Because it offers a low-cost and fast way to collect this type of information, Field Agent has opened up a market for small and mid-sized businesses that didn’t have access to this type of service previously. Sharp’s Sales Promotions Services firm tried to collect similar information before using Field Agent through a patchwork group of colleagues, friends, and associates. It wasn’t unusual to send a person back to a store several times to collect all the data he wanted. But Field Agent’s app clearly outlines exactly what must be completed for the task to be paid, and the user is looking at it on their smartphone as they’re doing the job. Using the service allows Sharp to cover more locations and a wider variety of retailers. Collecting information with the app has become a regular part of project development for the marketing firm. Each project has a budget of $500 to $1,000 set aside for Field Agent (usually paying around $7.50 per task) and that amount will be growing, Sharp says. In addition to offering access to a squad of Moms armed with iPhones, Field Agent also offers a database of retail locations across Canada. It has the locations of all 41 Loblaws stores in Ontario, Doucette says, so clients can ask for information from the stores without needing to know each address. Users of Field Agent Canada are typically shoppers that are already in the stores where tasks can be completed to earn a few extra dollars. Annie B. is a Windsor, Ont.-based Field Agent user and a single mother. She turns completing the assignments into a game that her kids can assist with, and says she makes $50 per month as a result. Payment is received via PayPal. For marketing entrepreneur Sharp, it’s a service that allows him to spend his long weekends sipping on a beer while crowd-sourced agents visit beer store locations to collect detailed information.